A highly unusual painting has been discovered in a small church in the picturesque Italian town of Tuscany painted by the artist Ventura Salimbeni. 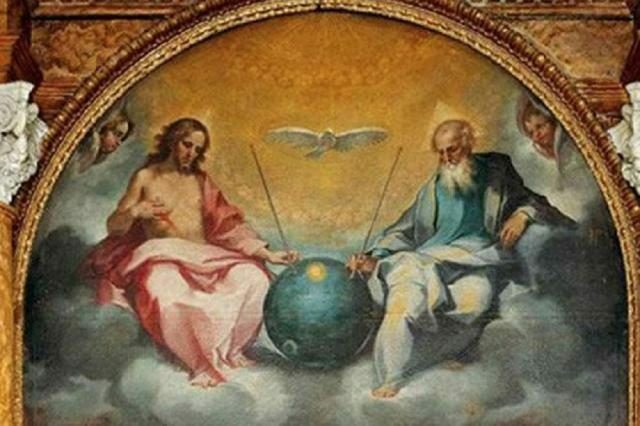 The painting depicts God and Jesus on either side of a mysterious object which bears an incredibly uncanny resemblance to the Russian spacecraft Sputnik. The painting was completed in the sixteenth century, almost four hundred years before Sputnik became the first human object to enter space. A NEW THEORY ASKS: ARE WE ALL ALIEN WORSHIPPERS? IS GOD AN ALIEN? Critics have suggested that the object is not as unusual as it may appear and is simply a symbolic image representing the world, or perhaps the universe. However, this explanation hasn’t convinced many people that there isn’t something more mysterious going on beneath the surface. If the spherical object is supposed to represent the Earth, then why does it have two antennae protruding from the top? Why is it presented as reflecting light in the manner of a metal object? This is not the first time that unusual futuristic objects and hints at extra-terrestrial activity have been uncovered in the annals of historical art. Paintings from the medieval period often depict bizarre objects which look a lot like modern representations of flying saucers in religious art. The appearance of this kind of symbol in classical art raises a number of questions about the connection between religion and extra-terrestrial life. Could it be that the inspiration for these pieces of art came from an alien source? The prominent UFO researcher, Scott Waring certainly believes that this could be the case. Speaking about the topic has suggested that the artist may have had a vision of the creation of Sputnik. He said that it is not uncommon for aliens to imprint this kind of vision in the minds of artists and other influential people and this kind of practice has been reported as occurring since the very beginning of human existence. If that truly is the case, a mystery remains surrounding these unusual paintings. What is the precise message that the aliens were trying to convey to humanity? READ 2010: How Old Is This Earth? Posted in ReligionTagged Ancient, Mythology & ReligioncommentLeave a Comment on A Painting From The 16th Century Reveals: God Is An Alien!